Discussion in 'Army & Security Forces' started by t68, Sep 23, 2018. I came across this photo whilst looking for information about Australian Army transport in Vietnam, the photo didn't come with any information. by the flag on top its a S Vietnam vehicle. I'm also assuming it was some sort of hybrid by the South Vietnam from a unserviceable M113 hull. does anyone have any information on what was done by whom and how many where done ? Roughly 1 in 10 Trucks in US convoys were gun trucks and there were 300-400 gun trucks made (no idea of the numbers that actually mounted an M113 but given the majority of gun truck pics don't contain an M113, I suspect a low number). 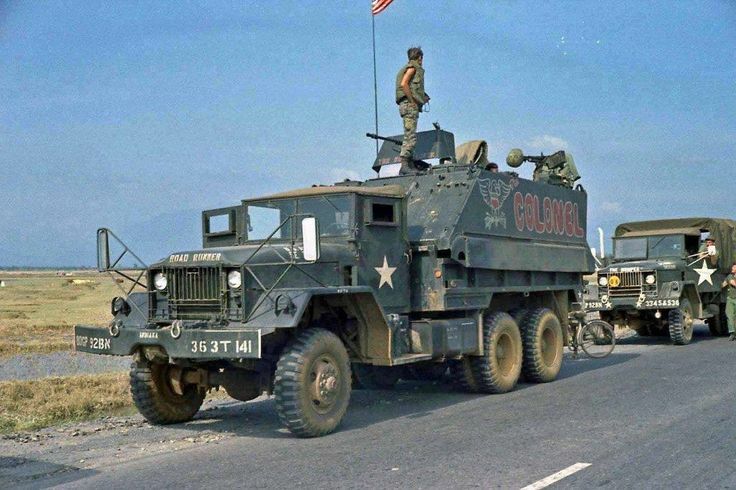 As steel kits to convert trucks became scarce, M113s were substituted. Role was purely defensive though in an ambush, they were meant to get into the hotspots and stand up to the Viet Cong. Very reminiscent of Iraq and Afghanistan where Hummers and Strykers/ASLAVs/etc had whatever was available added to make them more RPG/IED proof (and ended up looking more like Mad Max/hillbilly bespoke builds than standard military kit). There are a number of publications and Google (including a Wiki article on Gun Trucks) that can assist. ramp was not used for entry and exit, but rather the smaller hatch set in the ramp." has a number of further examples, so fairly common. http://www.vietnam-guntrucks.com/wp-content/uploads/2014/02/2227ConvoyAmbushVol1Proof141.pdf has Convoy Ambush case studies for Vietnam and Korea. Lots of Google pics under the search term "Vietnam Gun Trucks". Adding M113 or APC reduces the number of non-m113 shots. M54 using the same basic configuration. This was a single-walled truck, not double-walled. A couple of web sites have pics of The Colonel both in country and reconstructed in the States. M54 with M113 Guntruck (Colonel) Walk Around Page 1 This is a Vietnam era guntruck made from a M54 and M113 located at Ft. Leonard Wood. This vehicle is a replica (see above). Index of /wp-content/gallery/vietnam-gun-trucks-and-jeeps-from-ralph-fuller-lt-ugly-rangers-site has pics of lots of Gun Trucks including "The Colonel" filed under "Colonel"
Thank you for all the information very interesting, just haven't seen the M113 hull mated to a 6x6 truck before like this. I knew straight away it wasn't meant to haul troops around protected as it would have been a very step long drop from the rear. On the flag yep you right, I just saw the red strips and remembered that the South had them on their flag. then relised that they are in the middle section of the flag. I am fascinated by improvised AFVs. Is anyone up for a series on quirky improvised vehicles? Libya under the rule of Muammar Gaddafi was once considered as one massive arms depot. 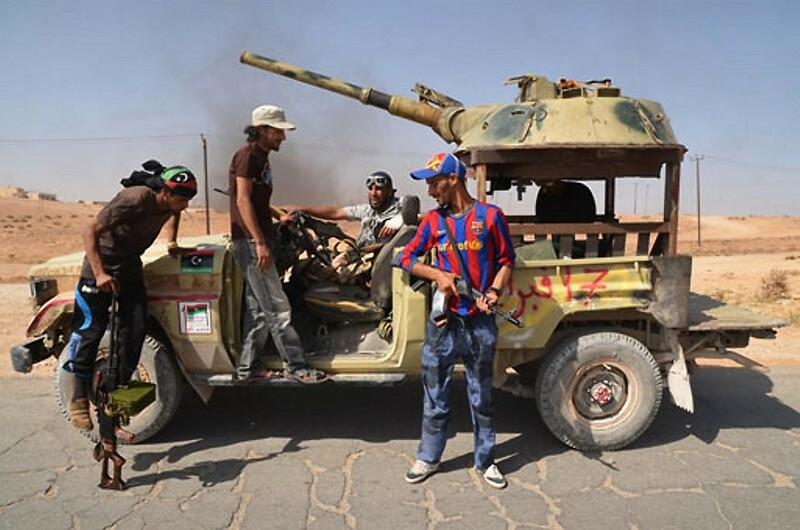 In fact, the amount of weaponry in store far surpassed Libya's own needs. 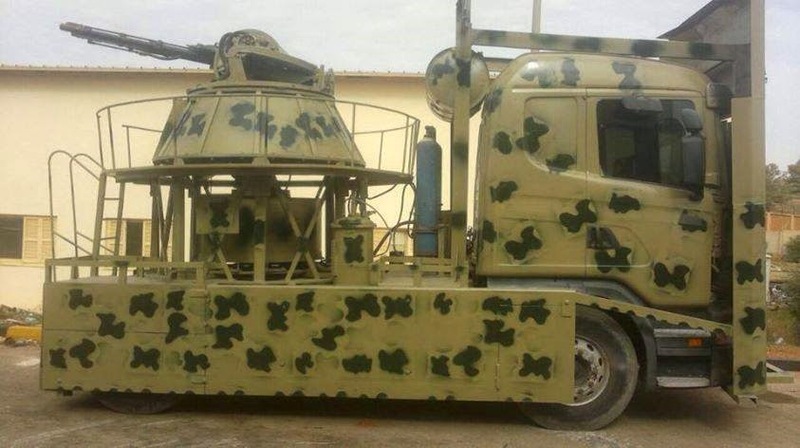 This allowed Gaddafi to use a part of this weaponry to supply various groups throughout the world opposing the West, or to donate it to countries in the Middle East and Africa. The donation of arms to the latter was mainly a sweetener in the hope that these counties would later support his idea for a United States of Africa, of which Gaddafi would 'of course' have been the leader. The many arms depots found in Libya have provided the many forces now fighting for control over Libya easy access to sophisticated weaponry. The lack of spare parts and technical personnel has meant that only a portion of such heavy weaponry re-entered service however. The imposed arms embargo on Libya's internationally recognised government prevents the acquisition of large numbers of new arms and spare parts for Libya's Armed Forces. This while one of the many opposing factions, Libya Dawn, is known to receive arms from several countries in the MENA region. This forced the Libyan National Army (LNA) to look for creative solutions to provide the required amount of firepower for its troops. 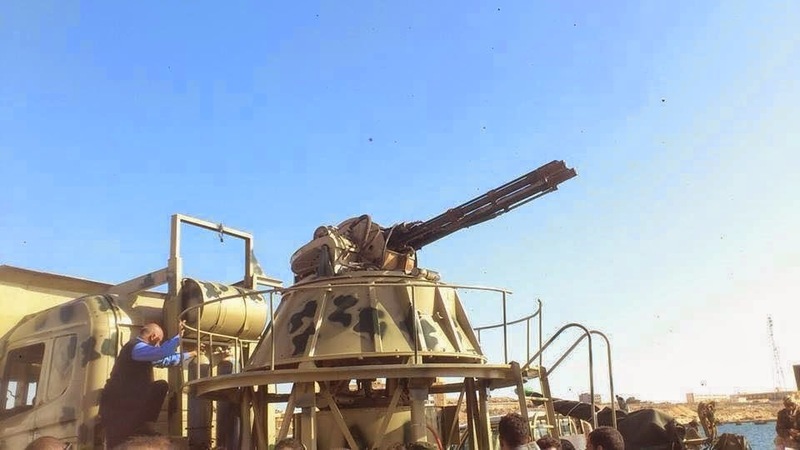 And while the Libyan Conflict has seen the birth of many outright strange vehicle conversions over the years, the LNA in Benghazi took the contest to a whole new level by installing 30mm naval guns on trucks. The first product of this limited series (seen above) combined a recently delivered Kamaz 6x6 with a double-barreled 30mm AK-230 naval gun originally found on Soviet fast attack craft, minesweepers and frigates. The AK-230's original task was to shoot down incoming missiles and aircraft while guided by a MR-104 Drum Tilt radar. To allow for easier access to the guns and munition, the turret was removed. The two 30mm NN-30 cannons are belt-fed, with each belt holding five-hundred rounds. Reloading the two cannons is extremely time-consuming, even for an experienced crew. The Libyan National Army is currently fighting Libya Dawn in Benghazi, where the latter is currently entrenched in the hope to hold the city. Libya Dawn was in control of most of Benghazi, but never managed to capture the port, which also serves as a base to to the Libyan Navy. 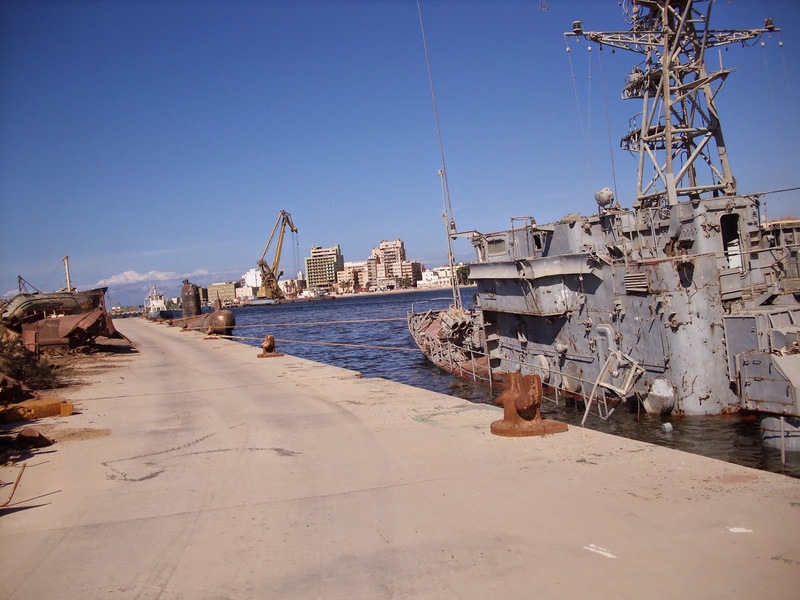 Benghazi's Naval Base was home to the Koni-class frigate 212 Al Hani, the Nanuchka-class corvette 416 Tariq-Ibn Ziyad, one of the few remaining Natya-class minesweepers and an inoperational Foxtrot-class submarine. However, the Al Hani left Benghazi a couple of years ago and the Tariq-Ibn Ziyad was set on fire by artillery and subsequently sunk. The single Natya-class minesweeper already sunk close to a year before due a lack of maintenance, but not before it was deprived of both of its AK-230 gun emplacements, which were subsequently installed on the Kamaz and Scania trucks. The remains of the unfortunate Natya-class minesweeper can be seen below. 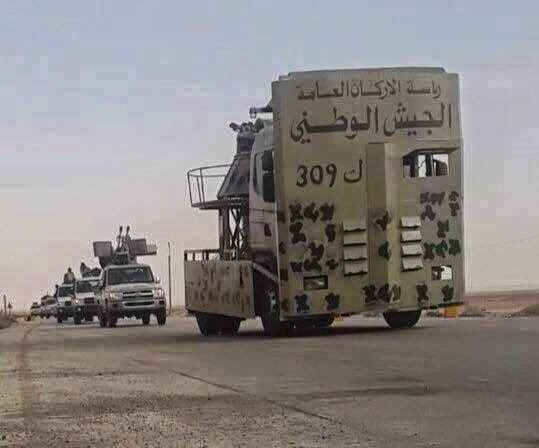 Both trucks are operated by the 309 Battalion, part of the Libyan National Army. The text seen on the front of the AK-230 armed Scania seen below reads: 'Board of the General Staff - The National Army K 309'. Wether or not this design is more practical than a 23mm ZU-23 or 30mm M1980 installed on a technical remains to be seen as both can achieve more or less the same fire rate and impact on the target, but the AK-230 is far harder to aim. 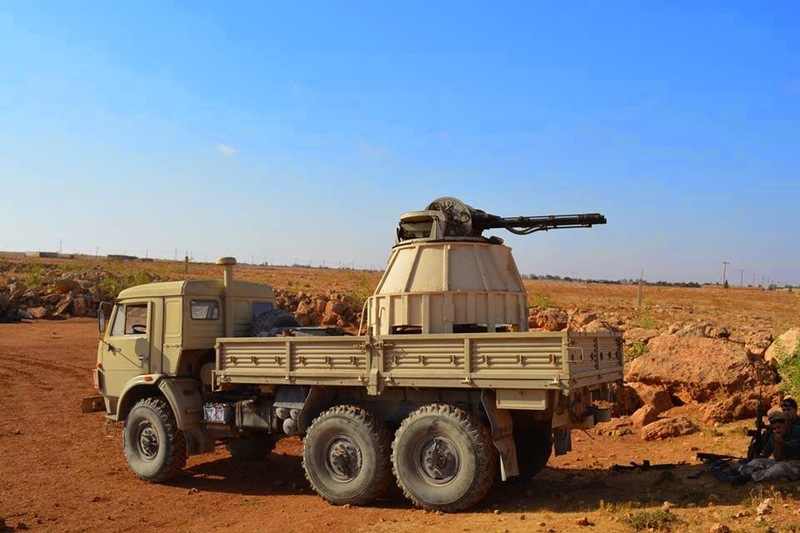 With no ceasefire or end of the arms embargo on Libya's National Army in sight, more interesting conversions are sure to see the light of day as the conflict continues. Very interesting! Thank you fro posting!